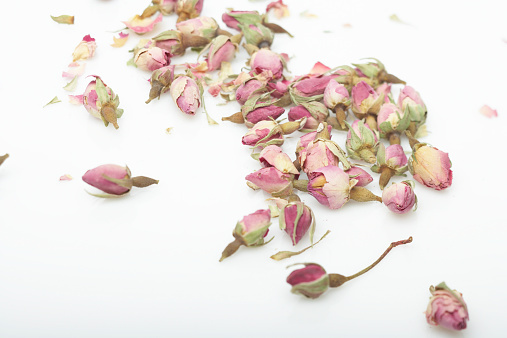 How to Revive Droopy-Headed Roses. Your sweetie has just spent a small fortune on roses for Valentine's Day. If this generous expression of love is in less than perfect condition and the buds are drooping at the top of the stems, try this simple way to revive these sentimental favorites. 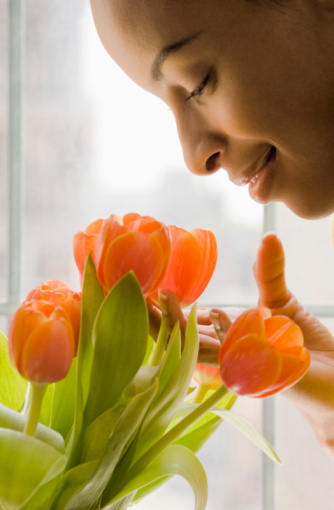 Remove the roses from the vase and set aside any greenery or baby's breath that accompanies the flowers. Separate the roses, but keep them in fresh water while you work. Make a fresh cut on each stem, about an inch or so up, while holding the stem under water. Cutting underwater allows a drop of water to adhere to the cut end while you move the flower; if you don't have this drop of water, air will enter the stem and cause the bud to droop. Roll each fresh-cut flower into a sheet of newspaper. The newspaper should be wrapped tightly to support the bud in line with the stem. Use rubber bands or tape so that the newspaper doesn't unroll. Submerge the wrapped rose in a deep, long container such as a bathtub or a sink. The rose should be completely under water. Roll, wrap and submerge the rest of the roses. Allow the roses to soak in their wrappers for several hours. Remove the wrapped roses from the submersion bath, unwrap each one and place in a vase filled with fresh water.